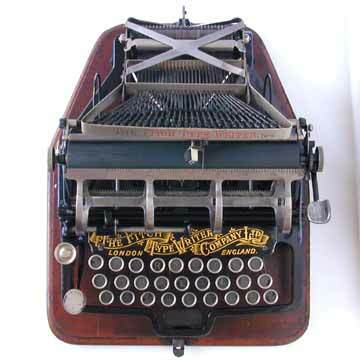 The Fitch typewriter was an American invention by Eugene Fitch of Des Moines, Iowa. He was granted a patent on the design in 1887 and the first machine was produced by the Fitch Typewriter Company of Brooklyn in 1888. However, the machine was also sold to a British company and production was taken up by the Fitch Typewriter Company in London. The Fitch is a downstrike machine. The typebars stand up from behind the machine and hit the platen from above. Like the Hammond, with the backtstrike hammer, Fitch needed to find a solution for the paper, which was rolled up and fed over the platen to a second roll behind the platen. The Fitch was not a very durable machine and production did not continue very long.